Driving down Magazine Street, through the South Market District, Harrison Avenue and Metairie Road, it seems as if boutiques are popping up and disappearing like rabbits in and out of a hat. Being a small business owner is a relentless task. You may possess all the right tools to make it work, an inedible work ethic, meticulous accounting, an ideal location, and fantastic goods and services. However, you cannot seem to capture the market to succeed. As a business owner, particularly under the category of fashion, it is easy to get caught up in the façade of the fashion world. A beautiful sales girl to take perfectly filtered selfies for Instagram and an inventory that has every must-have does not equal profit. Pretty cannot pay the bills. It has always been ALG Style’s priority to shop local and promote local. We aim to dress and style all our customers with local products and tout local services. We sympathize with our shop owners and understand more than most how difficult it is to keep the doors open and the lights on, nonetheless pay yourself a salary in the interim. During our 10 years in business, we have seen multitudes of boutiques open and close. Of the handful still in business, we have noticed recurring traits that contribute to each boutique’s success. 1. Work – This sounds insane, but yes — to own a business, you have to work 24/7 and have a visible presence in your store. Customers want to see the owner behind the desk and not at Pilates. 2. Customer Service – Just going the extra inch for the people that patronize your store is priceless. A little something extra, such as a note, a shoutout on social media or a verbal “Thank you!” is lovely. 3. Appearance – Even if it is smoke and mirrors, keeping the store clean, racks manageable and the sales staff off their SnapChat accounts during work hours can make or break a boutique. 4. Niche – Not everyone has to sell the same shoe up and down Metairie Road. Also, we are all fighting for the same customer. Go with what sells in your store; get to know your customer; and give them what they want. Try to be different and fresh. 5. All Money is Green – All too often we have seen business owners try to capture that 1 percent of the wealthy in New Orleans and its environs. It’s the boutiques that are reaching out to the masses and welcoming customers with smiling faces that have survived. 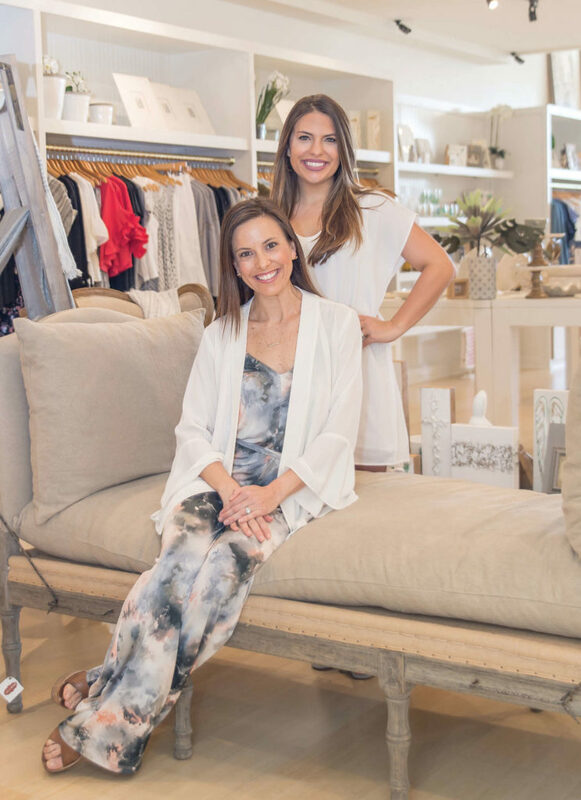 Sisters Lindsay Álvarez Laws and Kaitlyn Álvarez Tufts opened their first boutique on Magazine Street called Lucy Rose in August 2013. The two sisters dreamed of owning their own boutique together. They wanted to combine their professional and educational backgrounds (interior design for Laws and fashion merchandising for Tufts) to create an affordable yet fashionable boutique specializing in great style for customers and their homes. Lucy Rose caters to women of all ages and goes above and beyond for exceptional customer service. It was not long after the first location opened that the two were looking to expand into another location in Metairie or the French Quarter. “The French Quarter location kind of fell into our lap through word of mouth,” Laws says. “It was a prime location so we jumped on it.” This location on Chartres Street caters to the shopping trends of tourists; they adjust their inventory accordingly. “It is a much smaller store but gives you a little taste of Lucy Rose,” Laws adds. In February, Lucy Rose opened its third location on Metairie Road. Trying to keep up with their local customer base, Laws and Tufts wanted a store in a suburban environment. “We were told time and time again from our customers that we needed to be in Metairie or Lakeview,” Laws says. “Our local customers would complain about too much construction and lack of parking.” The pair decided to set their sights on Old Metairie so they could accommodate shoppers from all parts of the city. They wanted to surround the new location with other amazing boutiques similar to the locations in the French Quarter and Uptown. The new location has parking and is steps away from ALG’s other Metairie Road favorite retail spots such as EMs, Hemline, SNAP, VITA, Dolce and NOLA BOO. These two ladies in the past five years have had a wedding, three babies and opened three boutiques. One of these alone is enough to cause a bit of stress. The Álvarez sisters credit their incredibly supportive husbands and families to all their successes,and they attribute their remarkable work ethic to their mother. “Our mom will work all week at a full-time job and then come help us on the weekends,” Laws says. They hope to be an inspiration to other women and working mothers. These ladies understand what a challenge it is to keep their roles as small business owners, mothers and wives all thriving, but they are blessed with the love and support of each other as business partners, sisters and best friends. Visit any Lucy Rose location to gather all of your party supplies and fancy frocks for festival season.